Hurricane Shot Glasses – Double Walled Shot Glass Made of Durable Plastic! These unique, Reusable Plastic Shot Glasses feature a two-chamber cup that separates two beverages of your choice until you tilt the glass and enjoy your shot. The outer cup holds 4 ounces and the inner one holds 1 ounce. 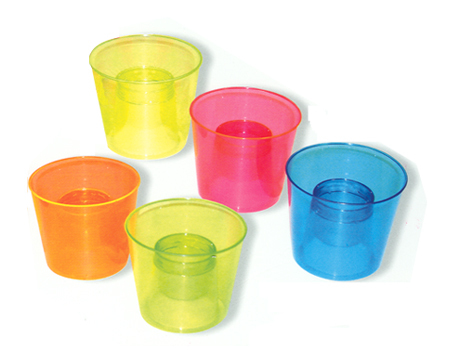 Bomber Shot Glasses are available in the following colors: blue, clear, green, orange, red, and yellow. Made of thick walled plastic, the cups will not allow liquid to pour over from one section to the next. Bomber Shooters are perfect for Jager Bombs, Cherry Bombs, Berry Bombs, Tick Tacks, Melon Bombs, and more! These Reusable Shot Glasses are sure to be a hit at your bar or promotional event. Custom imprinting is available for orders of 500 or more shot glasses. For more information on Custom Imprinted Hurricane Shooters, please contact us at 1-800-233-0828. Feel free to browse our selection of other Custom Plastic Glassware, including Lighted Plastic Shot Glasses, Hanging Plastic Shot Glasses, and more.